Up until now, only residents of Venice or notable people were allowed to be buried in the historic European city. 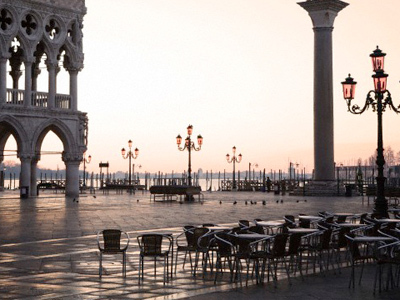 Starting this month, however, anyone can stay in Venice forever - after paying the appropriate fees, that is. According to The Guardian newspaper, non-residents will be charged €350 and residents only €50. This new initiative by Venetian officials has already been dubbed "Death in Venice" by the press, inspired by the novel by Thomas Mann and its film adaptation by Luchino Visconti. The city does not have enough land for actual burials, so a decision has been made to build a special platoon on San Michele Island which will extend into the lagoon. Grieving relatives will be able to scatter the ashes from there. There is also an alternative: urns can be emptied 700 meters out in the Adriatic Sea under the supervision of a public official. Boat carrying mourners will leave from the Lido – the beach in Venice where Dirk Bogarde draws his last breath in Visconti's film "Death in Venice." "We took into account the many foreigners who love this city and who would like to be buried here, but who would not find room at the cemetery," The Guardian quotes the city's environmental assessor, Gianfranco Bettin, as saying. For those who wish to scatter the ashes of their loved one on dry land, they can do so on the small lawn at the San Michele Island cemetery where Russian composer Igor Stravinsky, Soviet-American poet Joseph Brodsky, ballet entrepreneur Sergey Dyagilev and American poet Ezra Pound are buried. It is not a secret that the old lagoon city is in desperate need of money, as it continues to crumble from the effects of surrounding water. The city council hopes its new resolution will bring a much-needed injection of funds into Venice's coffers. The new initiative was approved by the Vatican, although it had been reluctant to support the project. Opponents of the move argue that turning the lagoon into a sea of the dead is not a very good idea. But even they acknowledge that the city, which is literally sinking into the sea, needs the money. It is also said that for people with more traditional views on the matter, there might be an option to actually bury urns in a special memorial garden on the San Michele Island. Until this month it had been prohibited by law out of ecological and moral concerns.